University Dining: Do you ever hear about MSG today? This is a blog started by a Dining Director of a private liberal arts university to share thoughts, ideas, and news about food, nutrition, wellness, sustainability, behavior, and any other topics of interest regarding university dining. Do you ever hear about MSG today? Back in the early 90s, there was a “no MSG” movement that many will remember and college students will not since they were just beginning their journey in life. It was an interesting lesson about food trends, hype, food labeling, and a little hysteria all mixed together. Monosodium glutamate (MSG) is a flavor enhancer in one form and a good preservative in other forms primarily for frozen prepared foods. It can be added as a seasoning or as a salt substitute as well. 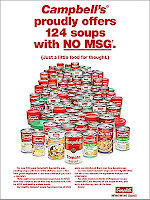 Do you ever hear about MSG today? Well, I did just the other day from a student and was taken back that they even knew the history of it. We do not use MSG here at Rice because we are a scratch made operation with very few frozen items with the exception of French fries and a few other things. By the way, I saw a student eating a plate of French fries for lunch and would kindly encourage you to try a little harder at a balanced diet. Usually this is where you find MSG, but I checked and they do not contain MSG. Hence the reason for writing this little tale… By the way, the FDA found no conclusive results about MSG causing allergic reactions or an increase in symptoms to asthmatics.